‘Scandia’ is the third part of the triptych ‘We Dream of Blue Whales’ and shows the Swedish leg of a journey I made sailing across the North Atlantic in a research vessel documenting whale and dolphin sightings in July 2014 with Pangaea Exploration. 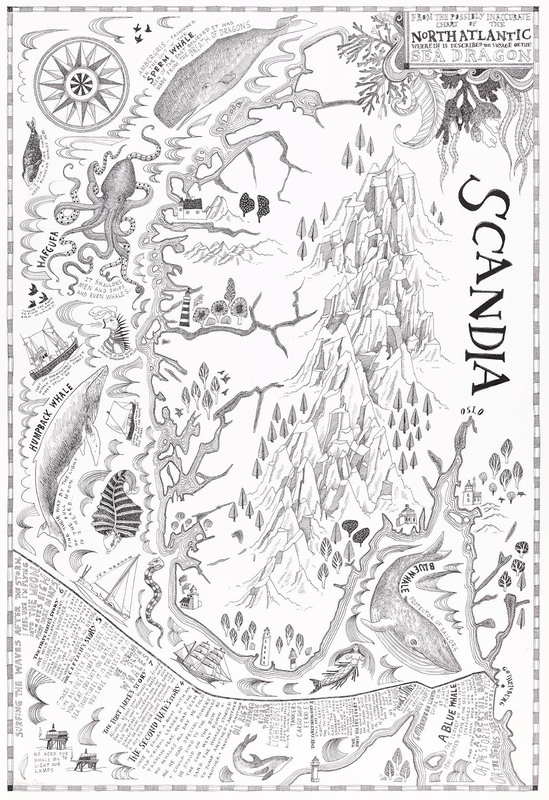 I originally imagined that the piece would show how Swedish people had understood and lived with whales throughout time, layering the information onto the map, but in the end, the piece became more about how we locate ourselves and remember location through stories, rather than geography. This piece was shown in the exhibition ‘The Whale Road’ in March 2015 alongside Katy Henery, Stuart Kuhn and Jonathan Hyde at Onca Gallery, Brighton in March 2015.